When you have Type 1 or Type 2 diabetes, eating a good balance of protein, carbohydrates, and healthy fats is crucial to controlling your blood sugar and weight. Some people find it helps to count carbs, too. So what's a well-balanced dinner look like when it comes to Type 1 or Type 2 diabetes? How can a patient with diabetes enjoy a power breakfast? Moreover, what foods should you try to avoid? Your doctor’s food guidelines are the building blocks of healthy eating as a patient with diabetes. Choosing within them and enjoying your meals is what this article is all about. What Does a Healthy Diet Look Like for Diabetes? Diabetes puts you at greater risk of heart disease and stroke. In fact heart disease and stroke are the leading causes of death among people with diabetes. So a healthy diet for diabetes is one that reduces your risks of those deadly conditions. A successful diabetes meal plan should also help you lose weight or maintain a healthy weight. While patients with diabetes can eat any food they like, moderation is crucial. 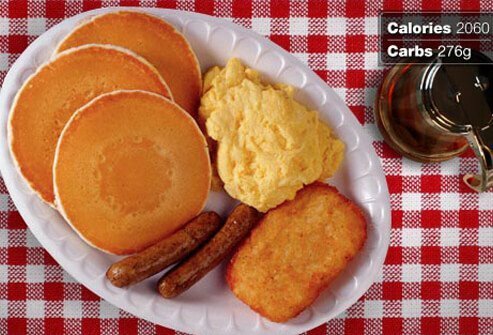 The problem with the traditional American farm breakfast (pancakes, sausage or bacon, eggs, and hash browns), is that you blow through your carb and calorie budget in a hurry. What Is the Carb Limit for Type 2 Diabetes? Experts suggest that meals for people with diabetes should have 45-75 grams of carbohydrates, depending on individual goals. Your body weight, activity, and medications all matter. This meal packs enough carbs for four to five meals, meaning you should steer clear. 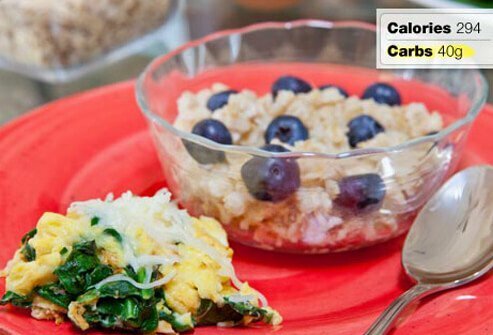 In this meal, comprised of eggs Florentine and oatmeal, lots of fiber helps slow digestion and prevent blood sugar spikes. Most of those 40 carbs come from fiber-rich oatmeal and blueberries. Why Do Carbs Matter With Diabetes? Carbohydrates fuel your body, and some are necessary to stay energized. But high-carb foods are the ones that spike blood sugar, too. You’ve sat down to a tasty Mexican food meal, and before the entrée comes to the table you’re greeted with a nice, big basket of chips with salsa. 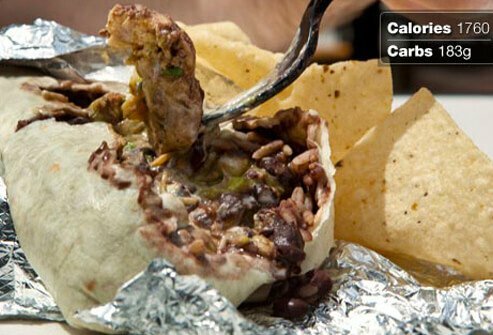 Before you even take a bite of your burrito, you’ve consumed 98 grams of carbs and 810 calories from that one basket of chips alone. 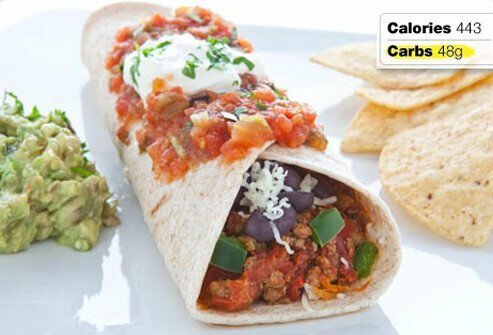 Once you’ve finished the burrito, you’ve consumed most of your calories for the day and way more carbs than you should eat in one meal. Not only that, but the sodium from the chips is sky-high—easily more than a day’s worth. Picking the right beans with your Mexican food can make a big difference to your health. Let’s compare the numbers. As you can see, black beans have refried beans beat on almost every level. The sodium level is much, much lower, saturated fat disappears, and fiber is slightly higher as well. There are slightly more carbs in black beans, but the fiber helps prevent that sugar from causing spikes in your blood sugar level. Go heavy on the veggies. Enjoy 10 small corn chips (1 ounce) with a little guacamole. All of that macaroni and cheese, corn on the cob, and sugary barbecue sauce lies in waiting on your plate, ready to ambush your daily carb intake goals. The fatty pork ribs add to the calorie cost, too. But corn is a vegetable, right? True, but remember: corn is one of the high-carb vegetables. One medium ear of corn packs 19 grams of carbohydrates. All in all, this meal is high-risk for anyone concerned about controlling their blood sugar and weight. Fortunately, there are healthier ways to enjoy pork, as you will see on the next slide. 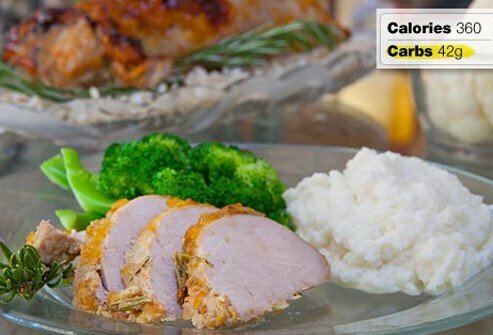 Pork tenderloin is one of the leanest and most versatile cuts of meat. Here it's prepared in a Dijon mustard glaze and served with steamed broccoli. “But wait!” you might be thinking. “Aren’t those mashed potatoes laden with diet-busting carbs?” Au contraire. These are mock mashed potatoes—pureed cauliflower that stands in beautifully for carb-heavy white potatoes. (Remember—from a diet perspective, potatoes are a starch, not a vegetable). Round out the meal with a whole wheat dinner roll, which will add some carbs, but also prevents blood-sugar spikes with additional fiber. A typical shrimp pasta Alfredo at your local Italian restaurant is often served in huge portions. Expect a whopping 73 grams of artery-clogging saturated fat. That’s bad news for anyone with diabetes, as doctors advise limiting saturated fat to about 15 grams per day for a 2,000-calorie diet. And speaking of that 2,000-calorie diet, exactly how can you stick to it given the calorie count on this dish? Do your heart a favor and say “hasta luego” to pasta Alfredo. 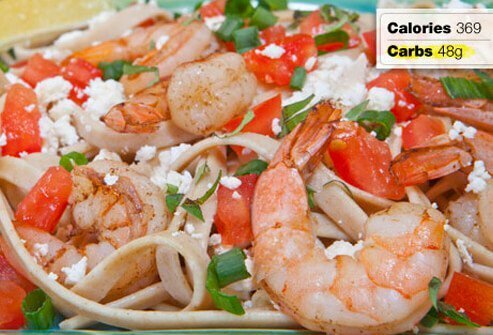 Naturally low-fat shrimp and ripe, juicy tomatoes make this pasta dish a winner for anyone, especially anyone concerned with the health of their heart. For an extra-healthy bonus, try pasta made from 50% to 100% whole grain to add the benefits of fiber: better blood sugar control and more satisfaction. While this salad offers a lot of flavor, pay attention to what it doesn’t have: heavy sauces full of saturated fats and sugars. Sometimes the sauce is the difference between a meal that’s healthy and nutritious and a meal that’s better to avoid. Feta cheese has a tangy flavor and 1/3 less fat than hard cheese. When you use cheeses with stronger flavors, you also need less of them. So a good way to get the healthy benefits of dairy without going overboard is to find robust cheeses that you like, and use them sparingly in your dishes. 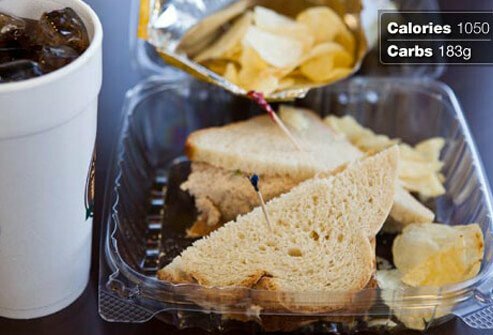 Lunch is just as important as other meals when you have diabetes, so don't grab just any sandwich or wrap. What’s wrong with the one shown here? It’s not the tuna itself, but what it comes with; Ready-to-eat tuna salad can be swimming in mayonnaise. Chips and a large, sugary drink push the total carbs to 183 grams: far too much for anyone who wants to avoid heart disease, especially anyone with diabetes. Another problem here is the plain, white bread this tuna sits on. White bread is a starch, and starches pack on carbs. Some starches can be included in a healthy diet, but it’s always a good idea to choose starches that balance the carb load with the added health benefits of fiber via whole grains. Look for breads with the “100% Whole Grain” stamp. Even breads stamped “Whole Grain” may made of up to 50 percent refined grain. Order a turkey sandwich on fresh, whole-grain bread, piled high with veggies. Those veggies and whole grains add fiber—six grams of fiber, in fact—which is important to any diet and helps control spikes in blood sugar. Make it a combo with fruit salad and a glass of low-fat milk for a terrific, diabetes-friendly meal. Milk, fruit, and veggies are all high in potassium, and potassium helps lower blood pressure. If you’re not used to eating enough fiber—and most Americans aren’t—you may be skeptical of how full you’ll feel from a high-fiber diet. “Will that salad really satisfy?” you may wonder. It may come as a surprise that one of the chief benefits of fiber is that it increases satiety—that’s the feeling of fullness you get after a meal. That’s because fiber slows your digestion and affects hormones that impact fullness. What’s more, fiber does this without adding many calories to your diet, which makes it ideal for weight loss. Adding plenty of water to a higher-fiber diet will also help you feel fuller longer. How much fiber is enough? The federal government’s official nutrition guide, “The Dietary Guidelines for Americans,” recommends 14 grams of fiber for every 1,000 calories consumed. The average American diet is well below this standard. Rotisserie chicken provides a reasonably good start for a Cajun gumbo lunch, but the sausage, oily soup base, and giant corn muffin make this meal a problem for anyone concerned about long-term health. 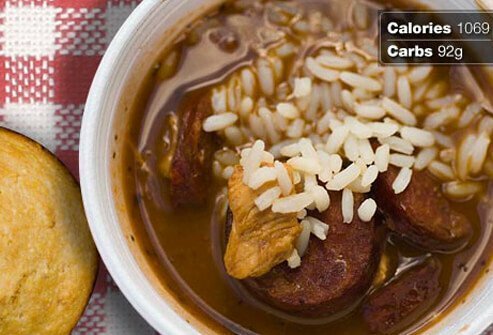 The fat, saturated fat, and calories in this gumbo are sky-high. The carbs in this meal would be manageable, except for that large corn muffin. 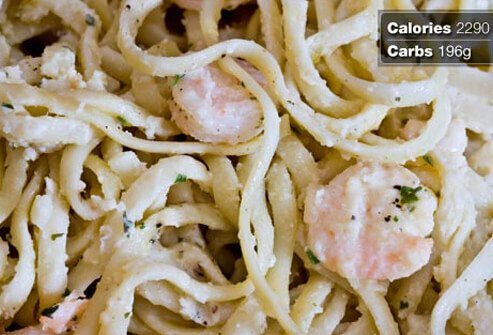 It has 71 grams of carbs, which blows your whole day’s carb intake in one meal. A mini-muffin offers the same taste for only about 9 grams of carbs. 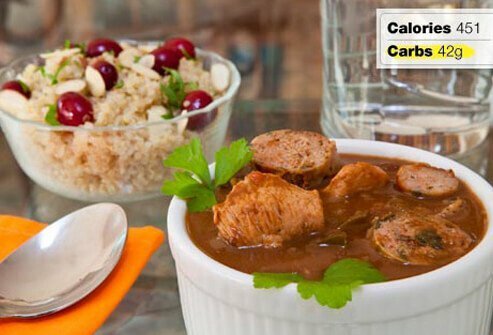 Gumbos you make at home are more likely to fit within your diabetes meal plan. That’s because you get to control exactly what goes into your meal. Use reduced-fat sausage, brown rice, and lots of high-fiber vegetables. Instead of getting your flavor from greasy soup bases, feel free to go wild with the Cajun spices, which add tons of kick without any additional carbs or calories. To complete this meal, add a whole-grain salad medley with nuts, dried fruit, and chopped veggies. The veggies bring up your daily fiber, something nearly everyone could use more of in their diet. 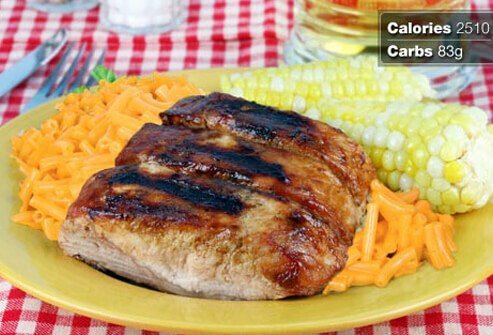 Chicken is a lean, healthy protein, so what’s wrong with this meal? 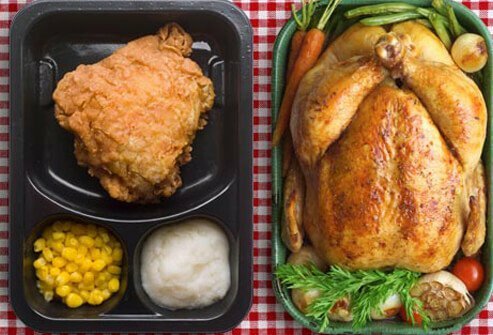 The big problem is the “fried” part of “fried chicken.” By ordering fried chicken, you’re also ordering a side of saturated fat, too much of which adds serious health risks later in life. 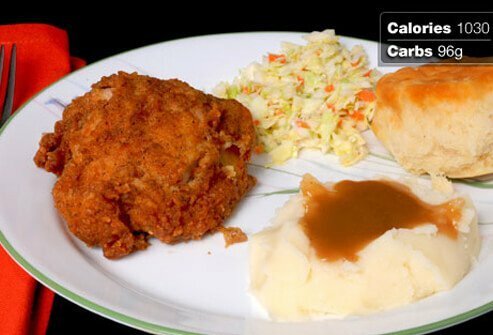 Meanwhile the mashed potatoes and biscuits are adding diet-wrecking carbs to your chicken dinner. Overall, this meal has way too many carbs and too much saturated fat to be healthy. Add to all that the sodium—more than twice your daily allowance—and you have a recipe for early heart problems, particularly if you suffer from Type 1 or Type 2 diabetes. Roast chicken is simple to make and tastes great. Serve up half a cup of skinless chicken breast. Add sweet potatoes and asparagus for a super-nutritious meal. Those sweet potatoes are high in fiber and vitamin A. Because they’re so naturally sweet, all the sweet potatoes need is a sprinkle of cinnamon. Some think cinnamon may help manage blood sugar, too, though the American Diabetes Association does not recommend cinnamon to help regulate blood glucose. You had to know this one was coming. Does anyone think a hamburger and french fries make for a healthy meal? A bacon cheeseburger, large fries, and large soda have more than two days’ worth of carbs, 2,700 calories, and 44 grams of saturated fat. That all adds up to a dangerous affront to your heart health. Keep in mind that meals like this contribute to heart disease and stroke, the two greatest killers of people suffering from diabetes. Still think it’s a tasty treat? 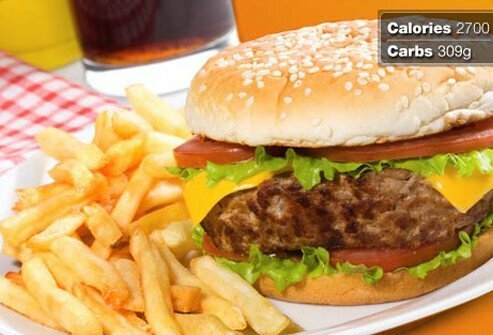 Part of the problem comes from the low price of such high-calorie, high-carb, high-fat food. "Upsizing" and low prices make it hard to eat small portions at burger joints, meaning if you eat frequently from fast food restaurants, your overall health outlook is likely to decline. To get a healthy burger fix, make this meal at home. Tuna gives you heart-healthy omega-3 fatty acids, while satisfying your protein needs with far fewer calories than a hamburger patty. 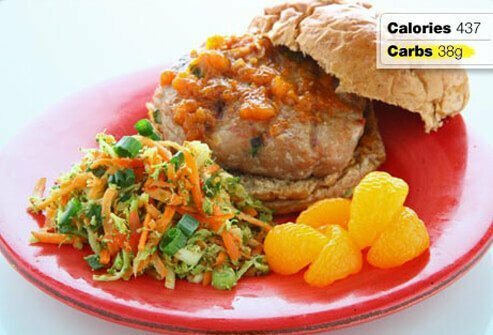 Add a whole-grain bun, ½ cup of broccoli-carrot slaw, and a few mandarin orange slices. All of that adds fiber. The sweet and tangy flavors also go great together! Just like chicken, fish is a healthy, lean source of protein. But when it comes fried, it brings lots of unwanted saturated fat. The breading, oil, and extra calories cancel out the health benefits of the fish itself. 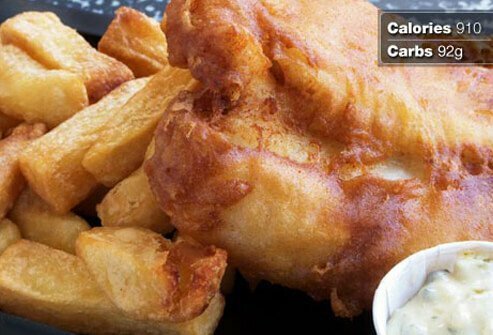 Not only is the fried fish a problem for anyone concerned about a healthy heart, those french fries in the typical fish and chips meal come with similar problems as well. Beware of fried sides, as well as coleslaw slathered in sugary mayonnaise dressing. Look for healthier ways to enjoy fish to save yourself from shipwrecking your health. A super meal for people with diabetes, or anyone else, begins with grilled or baked fish. The American Heart Association recommends eating fish twice a week for better heart health. They say eating fish regularly leads to a lower risk of heart disease. In fact the type of fish is secondary to just eating more fish, provided it’s prepared in a healthy way. Whether it’s farm-raised, wild-caught, high in omega-3 fatty acids or not, adding more fish to your plate will help keep your heart in good shape. To complete this healthy meal, add a grilled corn salsa and a beet, pear, and walnut salad. The total carbs don't go overboard (48 grams), and there's a good balance of other key nutrients: protein, fiber, and fat. Chinese food can be great for a healthy diet, but not all Chinese food is created equal. 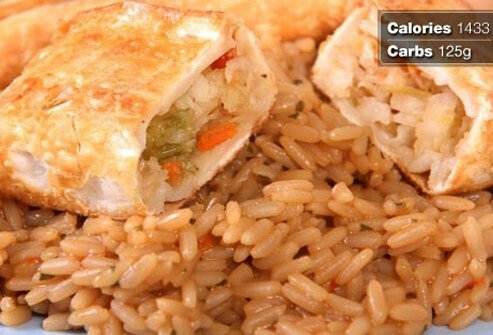 Deep fried egg rolls, fried rice, and a main dish dripping in oily or sugary sauce make the meal above an unhealthy choice. There’s another hidden danger in this particular meal. Some people with diabetes should have less than a third of the sodium found in this Chinese combo meal all day. That’s because about 25 percent of the population is salt sensitive, a condition that causes their blood pressure to rise from eating too much sodium. If you’re one of them, beware of soy sauce, a flavoring that sends the sodium content soaring. Just one tablespoon of soy sauce adds about 1,000 milligrams of sodium to your food. If you want to enjoy the flavor of Chinese food without all the negative health effects, start at home. 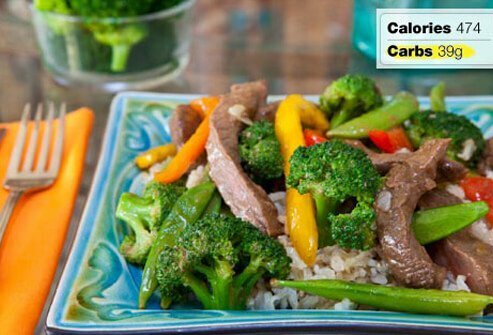 Make your own beef and broccoli stir-fry meal. Making it yourself allows you to choose a lean cut of beef and low-sodium soy sauce. Choose steamed instead of fried pot stickers to shave fat calories. For even less sodium, skip the soy sauce. Keep it uniform! Try to cut all your vegetables down to about the same size. Keep it dry! Don’t ruin your stir-fry with soggy vegetables. Water explodes when it gets too hot, which can lead to grease splatters and poor results. Try washing and draining the veggies earlier in the day to keep them dry. Keep them moving! Don’t forget the “stir” in “stir-fry.” By keeping your vegetables moving while they cook, you’ll be making sure they cook evenly and avoid burning. Akilen, R. Diabetic Medicine, Oct. 2010. American Diabetes Association, Complete Guide to Diabetes, 2011. “Beans, Black, Mature Seeds, Cooked, Boiled, Without Salt Nutrition Facts & Calories.” SelfNutrition Data. Chili’s Grill & Bar Restaurant. Constance, Brown-Riggs, MSEd, RD, CDE, spokesperson, American Dietetic Association; author, The African American Guide To Living Well With Diabetes, New Page Books, July 2010. “Diabetes, Heart Disease, and Stroke.” National Institute of Diabetes and Digestive and Kidney Diseases. Updated Feb 2014. 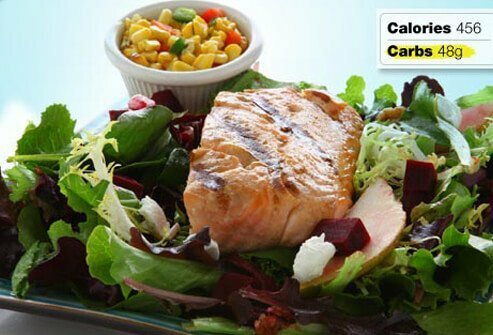 “Diabetes Meal Plans and a Healthy Diet.” American Diabetes Association. Updated July 1, 2015. “Does Cinnamon Help Lower Blood Glucose?” American Diabetes Association. “Eating Fish for Heart Health.” American Heart Association. Updated May 15, 2015. Harvard Medical School: "Healthy Eating for Type 2 Diabetes." Clegg, H. Holly Clegg’sTrim and Terrific Diabetic Cooking, American Diabetes Association, 2007. Hurley, J. Nutrition Action Healthletter: "Chinese Restaurant Food," March 2007. Liebman, B. Nutrition Action Health Letter, December 2011. Perkins Family Restaurant & Bakery. “Refried Beans, Canned, Traditional Style (Includes USDA Commodity.” SelfNutrition Data. Spano, Marie, MS, RD, CSCS. “Promoting Satiety.” Texas A&M University Department of Nutrition and Food Science. Updated Nov 2009. U.S. Department of Agriculture: "Nutrient Database." “U.Va. Researchers’ New Diagnostic Test Can Identify Each Person’s Optimal Salt Intake.” University of Virginia. Updated Apr 30, 2013. “Whole Grain Stamp.” Oldways Whole Grains Council. Wisse, Brent, MD. 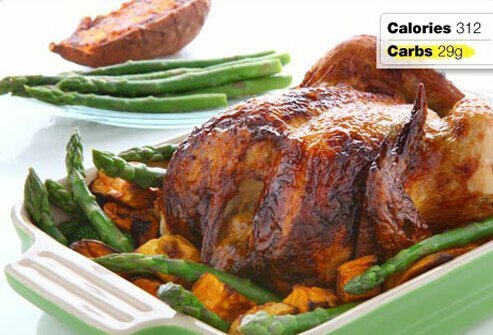 “Diabetes Type 2 – Meal Planning.” U.S. National Library of Medicine. Updated Jul 24, 2015.